A 59-year-old, diabetic patient, nonhypertensive male on medication for diabetes since 14 years and having history of alcohol consumption and tobacco-chewing since 10 years presented with pain in right heel which had persisted for 8 months. Pain was of a throbbing type and tended to aggravate on standing. The patient was treated with Matrābasti (Ksheerbala taila enema) and Sthānika iṣṭikā sveda (a form of sudation therapy performed with bricks) following which a clinical improvement was noted. 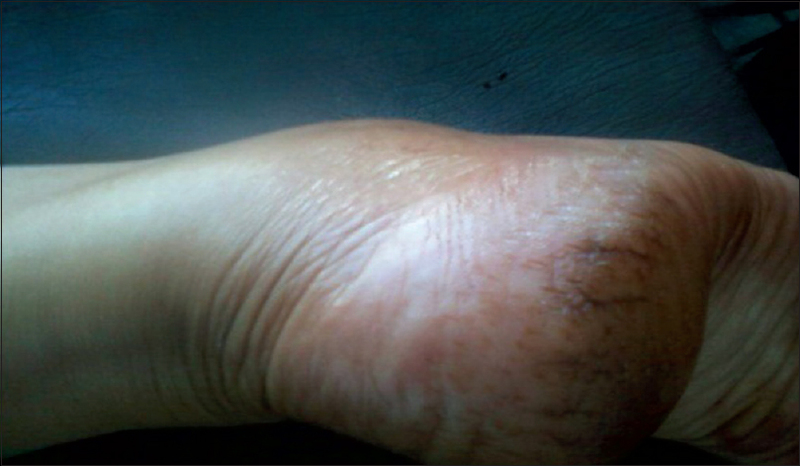 One month later, the patient reported with similar complaints with severe intensity associated with swelling and tenderness. The pain aggravated on standing, walking and used to get relieved with rest. With these complaints when patient reported to our hospital he was advised for radiograph of right heel, which revealed presence of the calcaneal spur. Respiratory and cardiovascular parameters were under normal limits. Local examination revealed swelling and redness over the area, increased local temperature and tenderness with grade 4. Sthānika abhyaṅga and Patrapoṭṭali sveda using Nirgundi and arka patra (local oleation and sudation therapies) were performed to achieve utkleśana (elevation of doṣas). Using a syringe, blood was removed for the purpose of reducing raktāvraṇa (a stage where channels are blocked by blood). This stage clinically diagnosed by grade 4 tenderness. After the first bloodletting, a marked reduction in pain, swelling, and tenderness were seen. The bloodletting procedure was repeated for 3 times on every alternate day. Pain, swelling, and tenderness were assessed. Pain was assessed on visual analogue scale, where "0" is no pain and "10" is severe pain. Local swelling was graded where grade "4" indicates severe swelling and grade "0" indicates no swelling. Tenderness was also graded with a grade "4" indicating not allowing to touch and grade "0" indicating no tenderness. All these parameters were evaluated before and after the treatment. The procedure was divided into preoperative, operative, and postoperative. The procedure was explained to the patient. Written consent was taken. Necessary investigations (HIV, hepatitis B surface antigen, bleeding time, and clotting time) were carried out. Patient was made to sit on the examination table, with his lower limbs hanging down from the table, and a stool was used as a support. Sthānika abhyaṅga of the affected site was done with Maρjiṣṭhādi taila and Snigdhapatra poṭṭalīsveda were performed [Figure 1]. Maρjiṣṭhādi tailam contains Maρjiṣṭhā as the main ingredient, and it has Vāta hara and Pitta hara properties. Materials needed for the procedure were collected, among them were: A 10 ml disposable syringe with 18 gauze needle which formed the modified Śṛṅga, cotton and haridrā (Curcuma longa). Under aseptic conditions, a vein was identified around the affected heel, and ankle joint and 10cc of blood was drawn from it [Figure 2]. After dressing, patient was hospitalized for 2-3 h for observation. Foot-end elevation was given [Figure 3]. After 1 h of application, there was a significant reduction of pain and redness. Results are shown in [Table 1]. In the present case, tenderness with a grade 4 was noted. It indicates involvement/engorgement of local blood vessels that can be considered as raktāvaraṇa (rakta = blood, āvaraṇa = obstruction). Raktamokṣaṇa was chosen as a method to remove raktāvaraṇa. Śṛṅga, one of the methods of raktamokṣaṇa, was chosen because it has ushṇa vīrya (hot potency), Madhura (sweet) and Snigdha (oleative) guṇas (characters), and thus recommended in vitiated blood with vāta. Here Śṛṅga as indicated by classics is a cow's horn. Considering practicality, an alternative for cow's horn is desirable. In the present case, we tried substituting cow-horn with a syringe and achieved the same desired results. Using a syringe is also more practical, hygienic, and can be practiced effectively done in OPD with least complications. In the case a cow-horn is to be used, sucking is required, which is not necessary in case of a syringe. In the present study, using a syringe has shown encouraging results. The chūṣaṇa kriyā (creating a vacuum and sucking out blood) creates a low pressure locally and improves venous circulation thus raktāvṛtavāta is relieved, and relief in pain is observed instantly. The swelling is reduced with the reduced tenderness and provides an anti-inflammatory effect. On repeating the procedure, there is a reduction in the tenderness grades, thus alleviating the pathology stages. The condition then becomes amenable to cure with oral medication. Syringing method can be used as an alternative to Śṛṅga therapy which is shown encouraging results in the present case and it needs to be studied on a large sample size. Srikantha Murthy KR, Astanga Sangraha Sutrasthana Varanasi: Chaukhambha Orientalia; 2011 p. 575. Gayadasacharya VY, Sushruta Samhita with Nibhandhasangraha commentary Shareerasthana. Varanasi: Chaukhamba Orientalia; 2012. p. 383. Davies MS, Weiss GA, Saxby TS. Plantar fasciitis: How successful is surgical intervention? Foot Ankle Int 1999; 20:803-7. Saxena A, Fullem B. Plantar fascia ruptures in athletes. Am J Sports Med 2004; 32:662-5. Gayadasacharya Acharya VY, Sushruta Samhita with Nibhandhasangraha commentary Nidana Sthana Varanasi: Chaukhamba Orientalia; 2012. p. 269. Sharma R, Varma S. Sahrastrayogam; Taila Prakaranam. Delhi Chaukhamba Sanskrit Pratisthan; 2012. p. 93. Koca T, Aydýn A, Sezen D, Baþaran H, Karaca S. Painful plantar heel spur treatment with Co-60 teletherapy: Factors influencing treatment outcome. Springerplus 2014; 3:21.